At Southridge Family & Cosmetic Dentistry, we offer a wide range of dentistry solutions to meet any patient need. From regular preventive dental checkups to advanced tooth replacement, we offer the dentistry services Denton dental patients need to achieve and maintain their healthiest smiles. In recent years, more and more patients have expressed interest in Invisalign clear braces. This alignment tray orthodontic system makes it possible for patients to achieve a straighter, healthier smile without needing to mar their appearance with traditional metal brackets and wires. Our skilled cosmetic dentist, Ted Dunson II, DDS, has years of experience working with patients to achieve their desired orthodontic results without the hassle of traditional braces. If you’re interested in learning more about your orthodontic options at Southridge Family & Cosmetic Dentistry, contact our Denton dental office to schedule your Invisalign consultation today. Invisalign uses a series of clear plastic alignment trays to shift teeth into their ideal alignment over the course of about twelve months of treatment. Each set of aligners is made of clear plastic, and they are formed to represent the position of the teeth one step closer to the desired end result. 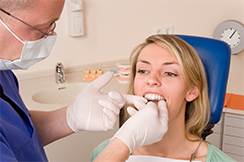 Patients will wear each set of alignment trays for about two weeks at a time. Then, they will exchange the current aligners for the next set in the series. Every six to eight weeks, patients will need to visit our Denton office for a dental checkup to ensure their treatment is progressing according to plan. The entire treatment typically takes between ten and eighteen months. Throughout your entire Invisalign treatment plan, all anyone else will see is your beautiful smile.